What would be more fun then a real Red Bird in your home that flies. Angry Bird fans will love this. 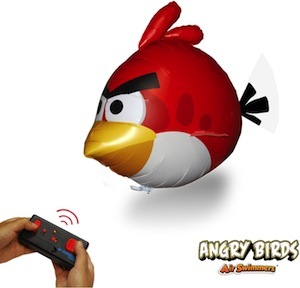 The Angry Birds air swimmer is a remote control bird that you can fly around. The bird itself is like a balloon that you inflate with helium (not included) and then you can just fly it around. It’s easy and so much fun. Come and check out this Angry Birds Red Bird Air Swimmer.